All transactions are safe and secure with a reliable history in online purchasing behind each of our associates. Buy the Dexter Knife t-shirt to own Dexter clothing and merchandise. After injecting his victims with a powerful animal tranquilizer and wrapping them up in cellophane, Dexter (Michael Hall) uses a wide variety of devices, including power drills and knives, to torture the sinners. His adoptive father, Harry Morgan (James Remar), taught him how to elude police, including his sister Debra (Jennifer Carpenter). Nab any of our killer Dexter tees to knock the socks off fellow fans. 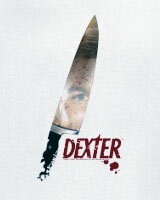 For those who have not seen it, encourage them to check out Showtime Dexter DVDs. In addition to the Dexter Knife tee above, browse the Dexter Clothing Gallery for more apparel like men's and women's clothes, kids shirts or hoodies.